41 Acre equestrian farm, 7,800 s.f. barn featuring (5) boarding stalls, (5) mare/foaling stalls, ( double sized ), tack room, office, 1/2 bath, wash stall, feed storage area, hay drop to all stalls, Nelson watering and fly control systems, rubber matting in all stalls and barn center aisle. All double stalls can easily be divided into two singles. Heat sensors through out barn and home above, loft has direct entry into 1,468 s.f. living space.Home above: Features (9) foot ceilings, (2) bedrooms, (2) full baths, galley kitchen, walk in closets, utility room, large common area of office, living room / den and dining room with direct access to spacious covered balcony overlooking the pastures and ponds. All interior walls and ceilings freshly painted February 2019.Property features: Gated stone column entrance, dressage arena, jumping arena, steeple chase course, riding trails, fenced paddock, (3) walk ins, 1,990 s.f. workshop with (3) bays, roll up doors, full loft, inside stairs, one pre-fab building which is insulated, has electric and half loft storage, metal roof and various other out buildings. Property is bounded on two sides by Tennessee Conservation land and one side with year round running water creek. 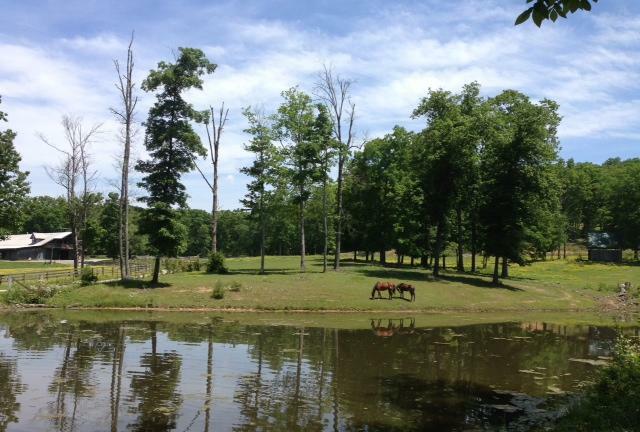 23 +- acre pasture, balance of property in mixed hardwoods and pine trees. (2) ponds and (2)deep wells. Property sold " As Is ".